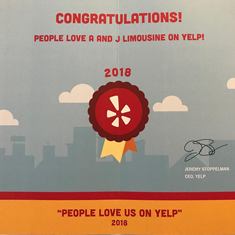 A and J Limousine was started in 2002 and is a locally owned Santa Barbara Limo Company operated by Andrea and Justin Plackett. Our company was started with one limousine and operated by word of mouth for the first year of business. We offer a variety of services that include, wine tours, weddings, prom nights, anniversaries, corporate events and airport transportation! Take a look and see at what we can offer you! Have a question? We have your answers! Give us a call at 805-683-7772 or fill out out contact form for a quick response! A and J Limousine offers luxury black car and limousine service for Santa Barbara and surrounding areas including, Montecito, Goleta, Carpinteria, Santa Ynez and Ventura County as well as all local airports. 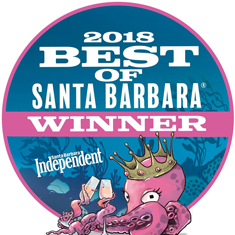 A and J Limousine in Santa Barbara specializes in Wine Tours, Weddings, Airport Transfers, Funeral Service Transportation, Proms, Birthdays, Anniversaries, Bachelor/Bachelorette Parties and Executive/Corporate Transportation/Accounts. 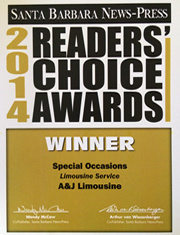 A and J Limousine can meet your Santa Barbara transportation needs with our versatile, reliable and immaculate fleet. You can always expect our limo drivers to be on-time, courteous, and professionally dressed. 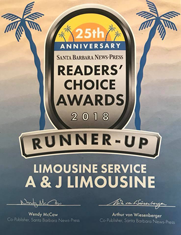 A and J Limousine’s goal is to ensure the complete satisfaction of every customer, while offering knowledgeable and friendly luxury limo service for Santa Barbara. Our hope is that you'll feel confident in our ability to meet all of your expectations and know that our customers are always our number one focus. That’s why we offer 24 hour service and a live person to take your calls and to answer all of your Santa Barbara transportation inquiries. 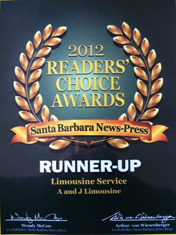 Our Santa Barbara Sedans, SUV’s, Luxury Vans and Stretch Limos are maintained on a daily basis. We also have special packages for Wine Tours, Weddings, Concerts and Sporting Events. Call us today to book your luxury transportation and for more details about our specials and packages. We look forward to hearing from you!